Boho chic style has conquered the world: we see relaxed, sun-filled and welcoming interiors in this style everywhere. If you wanna dip into it, too, or are already doing it, fringe is one of the popular details and decor elements that you may incorporate. 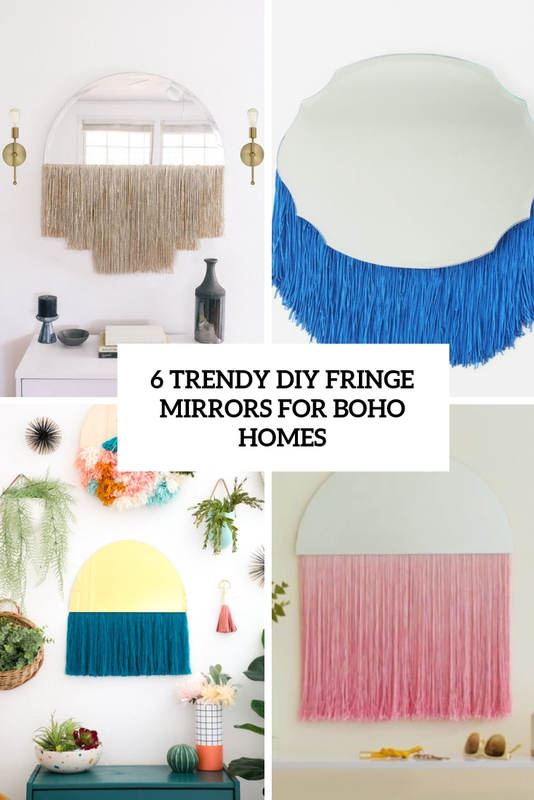 Fringe mirrors are a huge trend for boho chic interiors buy they cost a pretty penny if you wanna buy one. the best idea is to quickly DIY a piece that perfectly matches your space, and here are some tutorials that you may use. Spice up your entryway, bedroom, or hallway with a bold statement piece that’s sure to mesmerize and beautify. The blush pink fringe is the perfect pop of color, and the sleek shape has “chic” written all over it, though you may opt for various colors that match your space. Besides, this is a semi-circle mirror, which is all the rage right now – I can’t imagine anything more boho-like than this piece! 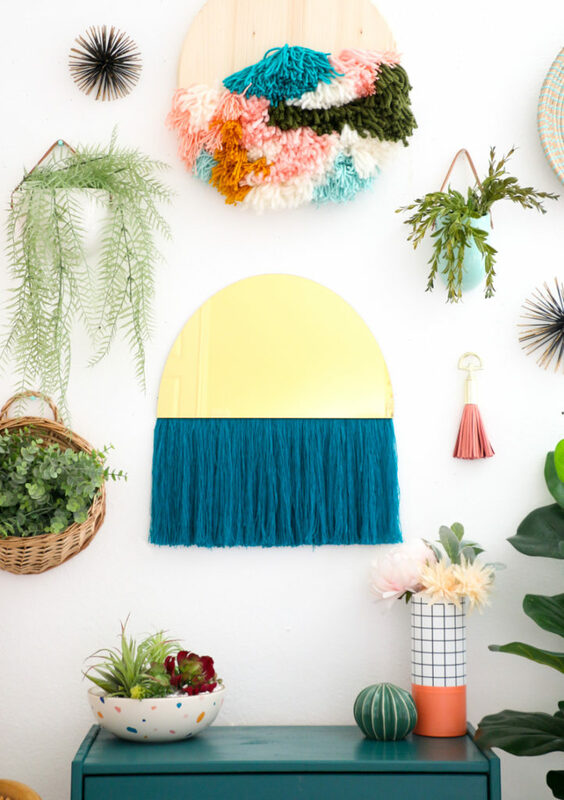 See how to make your own, from cutting your own custom mirror to dip-dyeing the perfect fringe, with this helpful tutorial. This beautiful DIY mirror is inspired by a gorgeous designer mirror but it’s a much more budget-friendly version of it. 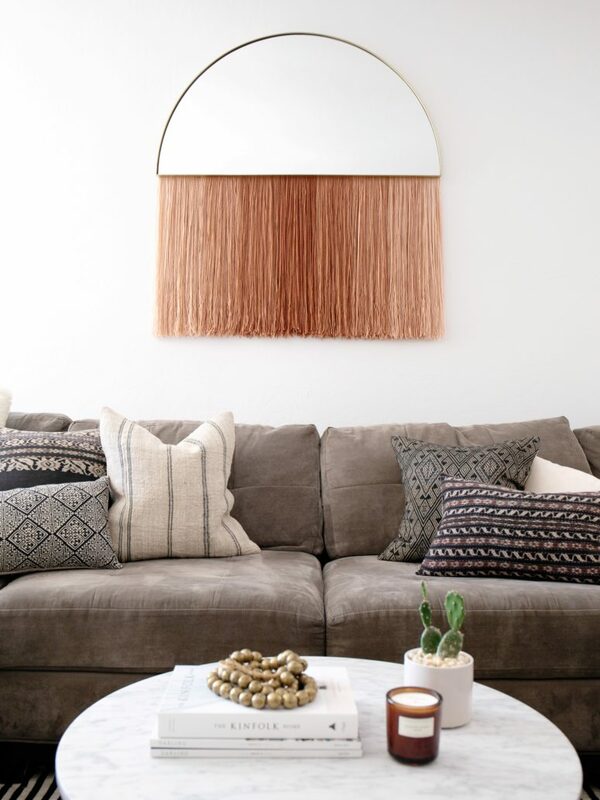 This is a semi-circle mirror with long champagne-colored fringe of various lengths – half mirror, half wall hanging, and we just love the boho sparkle it adds to a space! Choose the lengths of your fringe according to the size of the mirror – read the tutorial and go craft one! This craft will tell you how to make a stylish and edgy boho fringe mirror using gold mirror acrylic and fringe! Such mirrors come with a mighty hefty price tag but you can DIY one and forget about breaking the bank! First things first, the gold mirror acrylic actually functions as a real mirror. There is just a gold tone to it since it is gold mirror. The mirror acrylic also comes in different colors, just google search “mirror acrylic sheets” to find all the retailers selling the different colors. 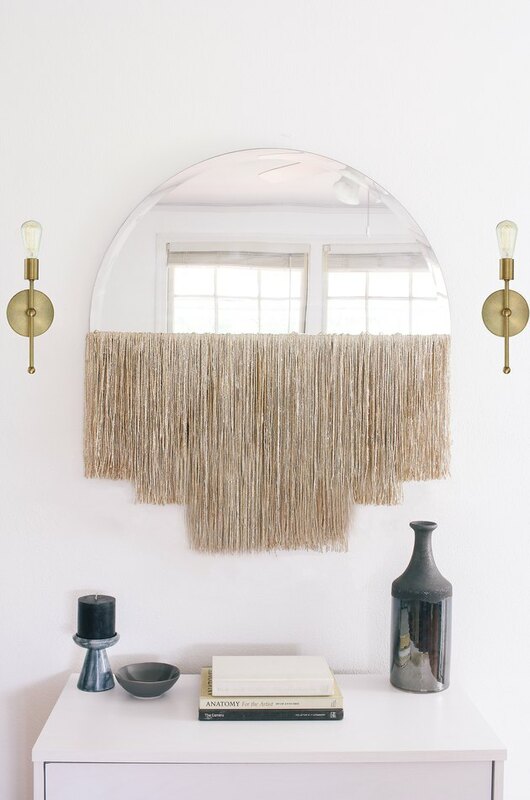 Of course you can vary the look of your DIY gold mirror acrylic fringe mirror by changing out the color of the acrylic and the yarn. 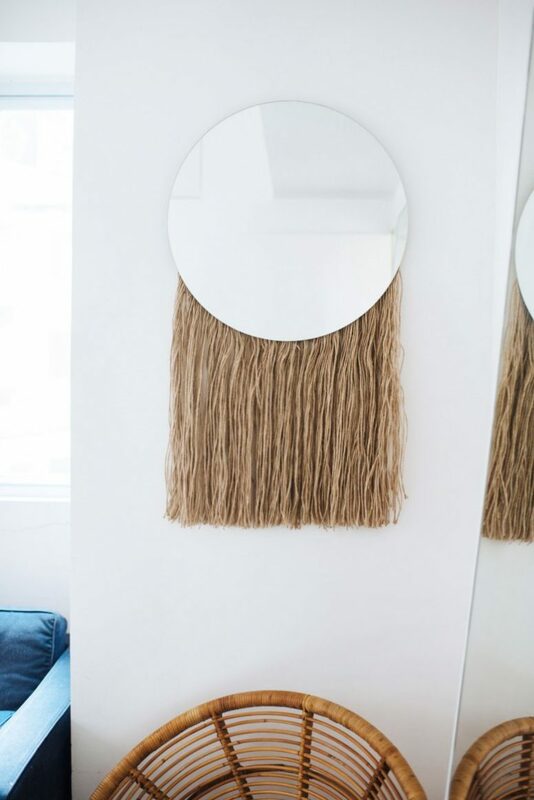 The level of obsession I have with lunar-inspired, half-circle fringed mirror wall hangings has reached a whole new level when I saw this beautiful piece. 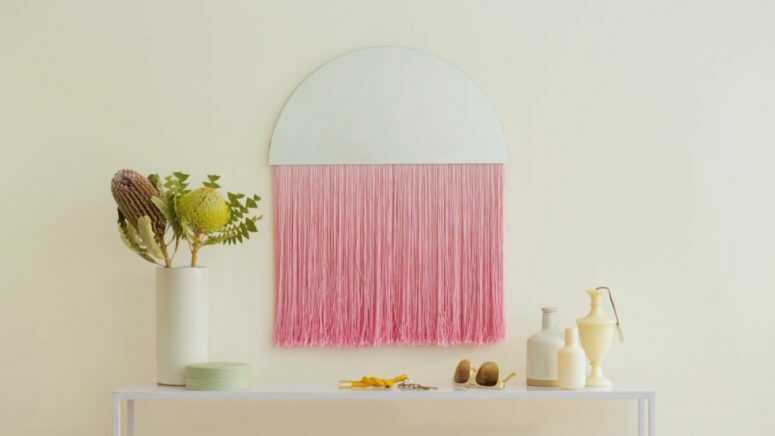 This is a semi-circular mirror with long blush fringe, and it’s totally perfect for living rooms, bedrooms, entryways and other spaces with a boho feel. While painting or dipping the yarn, you may go for ombre effects if you want. Such a beautiful piece won’t break the bank and you’ll get very trendy and bold boho chic decor. Mirrors can do so much for a room: they can reflect light making the space look much bigger, lighter and inviting, they are functional for makeup and other stuff like that and of course they add decorative value. The trendiest mirror right now is a boho piece with long fringe of the color you like, and here’s one more project to make one. You can turn almost any ordinary mirror into something extraordinary that encapsulates brimming elegance and atmosphere and at the same time that’ll compliment any style. Here’s one more fringe mirror tutorial but this one is a bit different: here you won’t cut anything keeping the original mirror’s shape. 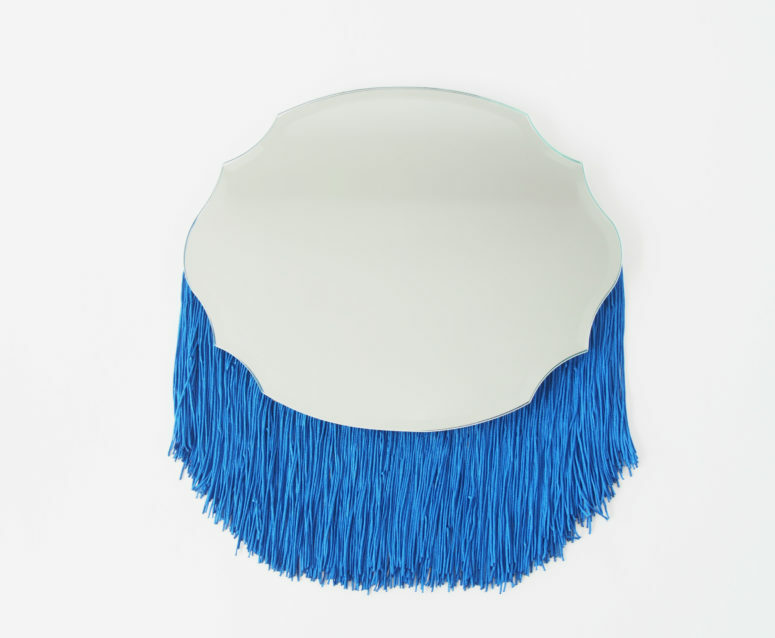 This is a round mirror with long tan-colored fringe, which is attached on the back of the mirror. Such a craft won’t take much time, while it looks amazing. Circle is the most popular mirror shape right now, so your boho piece will be extra trendy.